Can convert MKV files to all popular video and audio formats with super fast speed and high quality. Simple user interface make you do the job as easy as ABC. RER MKV Converter is a professional and comprehensive piece of software that provides you with the possibility to quickly and easily convert your favorite video files to MKV format with high speed and excellent output quality. · Preset many parameters for your Sony PSP, Apple iPod nano/video/classic/touch/TV Out, Apple TV, iPhone, Zune, Archos AV 500/700, Archos Gmini402, Creative Zen Vision, iriver PMP-100. · MKV Converter can help you convert MKV to WMV and FLV file which was much smaller for you to put it on your website and streamed across the internet. · Simply click the "+"button, you can add all source files needed to convert and click "Convert", RER MKV Converter will automatically convert them to the formats you want one by one. 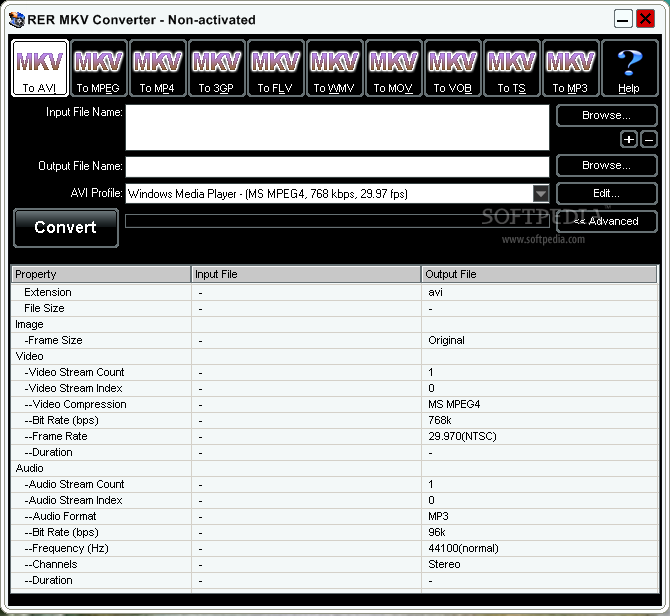 · RER MKV Converter is designed in sense of easy use. The program comes with a step by step wizard-like interface and all the functions can be used by simple mouse clicks.